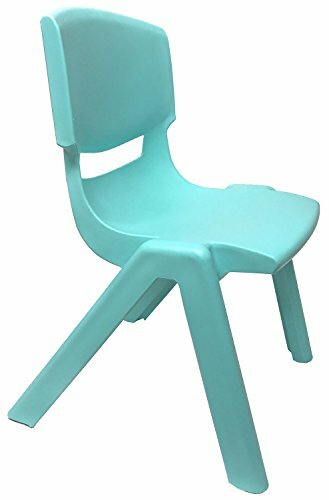 JOON Stackable Plastic Kids Learning Chairs, 20.8x12.5 Inches, The Perfect Chair for Playrooms, Schools, Daycares and Home (Baby Blue) by JOON at Indsight. MPN: KIDS-PLS-CHR-BBLU. Hurry! Limited time offer. Offer valid only while supplies last. JOON Stackable Plastic Kids Learning Chairs are a great development tool that provides knowledge, confidence and sitting habits that last a lifetime! JOON Stackable Plastic Kids Learning Chairs are a great development tool that provides knowledge, confidence and sitting habits that last a lifetime! These high quality chairs are made with 100% polypropylene plastic that will not crack, chip or peel. Besides being durable and sturdy they are also fade-resistant. The vibrant color will remain the same shade with proper care. JOON Stackable Kids Learning Chairs are FUN and EXCITING, the animated colors are a fun addition to the environment, brightening up any room! Children will be more excited to play or learn. The basic primary colors also helps aid early learning development. These high quality chairs have long lasting benefits! Made to encourage children to sit up correctly, which establishes proper sitting habits. Lightweight construction allows children to maneuver the chair themselves making them feel more independent and confident! The convenient design allows you to stack one chair neatly on top of another for cleanup time. JOON Stackable Learning Chairs are great for playrooms, schools, daycares and of course your home. This is a great investment for parents, teachers and a child's needs! Care Instructions: Wipe down periodically with a damp cloth or cleaning wipe. Weight: 3.5 pounds. Weight Capacity: 160 Pounds. Dimensions: 20.8x12.5x13.5 Inches. Back Height: 10 Inches. Seat Height from floor: 11 Inches. ✔ PREMIUM QUALITY & FADE RESISTANT made with 100% polypropylene plastic that will not crack, chip or peel. Besides being sturdy they are also fade-resistant! Vibrant color will remain the same shade with proper care. ✔ LONG LASTING BENEFITS providing knowledge, confidence and sitting habits that last a lifetime! These chairs establish proper sitting habits and are made to encourage children to sit up correctly. Lightweight construction allows children to maneuver the chair themselves making them feel more independent and confident! The basic primary colors helps aid early learning development. ✔ DURABLE holding up to 160 pounds in weight! The high quality material used in this chair can bare the weight of an adult. You do not have to worry about any injuries or accidents. Not only is the chair itself durable but the color is made to stay the shade when you first bought it. All you have to do to keep it that way is wipe it down periodically with a damp cloth or cleaning wipe. ✔ GREAT INVESTMENT JOON Stackable Kids Learning Chairs are easy to use as well as easy to clean. Sturdy materials and smart construction created the perfect chair. IDEAL FOR PLAYROOMS, SCHOOLS, DAYCARES and HOME. This is a great asset for parents, teachers and children! If you have any questions about this product by JOON, contact us by completing and submitting the form below. If you are looking for a specif part number, please include it with your message.